With kids comes clothes and with that comes laundry and I have at least a ” Mountain” of laundry come the end of the week, With one child that wears uniforms and then she comes home and puts on play clothes, but like with most kids it’s just not going out side oh no they seem to be attracted to sand, leaves , dirt etc.. My son will find away to get his clothes dirty and with that comes odors , funky smells and all around teenage boy smell. My girls are no exception my youngest has a habit of spilling what she eats on her clothes and mostly it is Milk and at the end of the day it has one of those smells and then there is the teenage daughter that prefers to lather or bathe her self in perfume and what not, So when it comes to Laundry day which is usually the entire weekend those “smells” are not so great and then there is the bedding ie.. blankets, sheets pillow case for all us and they of course trap in smells from body odor, dog odor . Into the washer they go now normally I would use liquid fabric softener but alas there is a newer concept out that involves a “crystal” like that gets added to the wash that dissolves while washing laundry and then when dried the scent is carried out , Does it last after being dried you ask ? 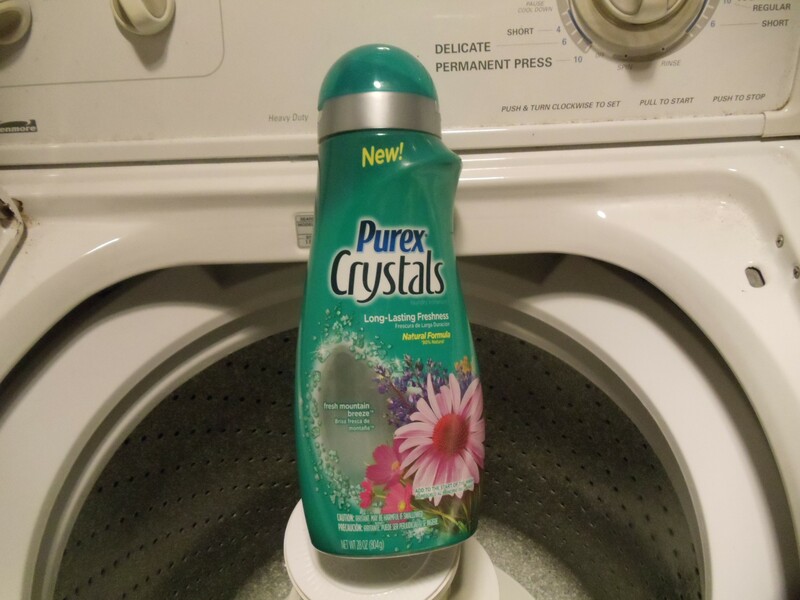 Why yes ,Yes it does I used Purex Crystal Mountain Breeze on last weeks load of laundry and I could still detect it through out the week,It is a simple concept really, Just add your desired amount with the pre-lined cap that is provided and add to the wash as the water in running to fill up your machine and that is it.